I can’t organize my thoughts so I’m just going to spill them out and sort them out some other time. Although it is a shame (a tragedy) that Bela Tarr will make no more films after this, but perhaps it is a fitting end. A farmer (we assume… he has a horse but it’s unclear exactly how he makes a living, if he does at all) and his daughter trudge joylessly through their monotonous routine. Getting dressed, schlepping water from the well, eating a meal of simply boiled potatoes, and for relaxation, staring out the window. Over the course of 6 days, we see — in a manner mildly reminiscent of Jeanne Dielman — the routine start to break down as some sort of vague apocalypse seems to be descending upon them. Life, what little is left of it, is draining out of the world. A neighbor delivers a monologue about the degradation of humanity, how the good people have quietly faded away while the rest debase everything they touch. A wandering pack of gypsies leaves the daughter (“eyes of the devil”) a religious text. Is it these two particular people who are doomed, or being judged? Or all of mankind? Tarr, as usual, not only doesn’t give answers, he doesn’t even let you know if he’s asking the question. Which is to say, if you loved any of Tarr’s previous four films, you will probably love this one, although it is his bleakest. The cinematography is, as one would expect, jaw-droppingly rich. From the opening shot of the horse defining the word “struggle”, to Ohlsdorfer’s sunken, skull-like eyes, to the spine-chilling image of the daughter’s beaten-down face staring out the window, the film is loaded with stark, gorgeous, unforgettable visions. Mihaly Vig once again submits an incredible score, a funereal dirge that shares the soundtrack with the incessant howling wind. 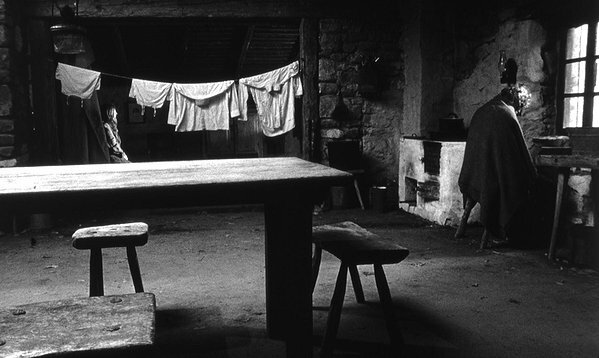 Tarr’s films have a tactile effect, and here you can truly feel the bitter cold of the landscape and the house that surely does little to protect its occupants from the elements. This entry was posted on December 22, 2011 at 9:00 am	and is filed under Movie Reviews. Tagged: bela tarr. You can follow any responses to this entry through the RSS 2.0 feed. You can leave a response, or trackback from your own site.